↑ "Who's No. 1? Texans, Williams sign contract". Archived from the original on May 6, 2006. Retrieved 2006-04-29. ↑ Williams became the first-ever number one draft pick to come from a school in the Atlantic Coast Conference. ↑ Reggie Bush was named the 2005 Heisman Trophy winner, but the award was forfeited due to issues with Bush's college eligibility "Reggie Bush to forfeit Heisman". ESPN.com. Retrieved 28 March 2011. ↑ The University of Texas at Austin extended its streak of consecutive drafts in which the school produced at least one drafted player to 69. ↑ Matt Leinart, 2004 Heisman Trophy winner "2004 Heisman Trophy winner". Retrieved 2011-03-28. ↑ The Rams traded the 11th overall selection to the Broncos for the 15th and 68th choices. ↑ The Browns traded the 12th overall selection to the Ravens for the 13th and 181st choices. ↑ Cromartie was the fourth Defensive player from Florida State selected in the first round; only twice previously had one school produced four first-round selections from one unit (offense or defense) in a single NFL draft. ↑ The University of Miami extended its streak of drafts in which at least one player from the school was selected in the first round to 12. ↑ Bullocks' identical twin brother, Josh Bullocks, also a safety from the University of Nebraska–Lincoln, was drafted by the New Orleans Saints in the same position in the 2005 draft. ↑ The Chiefs transferred the 117th overall pick to the Jets as compensation for the Jets' permitting Herman Edwards to leave the Jets to become head coach of the Chiefs. 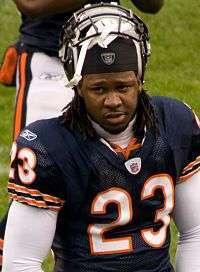 ↑ Cincinnati forfeited their third-round selection in the 2007 Draft. "Cincinnati Bengals Pick Ahmad Brooks in NFL Supplemental Draft". University of Virginia Athletics. July 13, 2006. Archived from the original on October 27, 2011. Retrieved October 27, 2011. ↑ Pasquarelli, Len (2006-07-15). "Former George Mason hoops star ends NFL dream". ESPN. Retrieved 2013-04-29. ↑ Pasquarelli, Len (2006-04-30). "UConn basketball player Nelson signs with Rams". ESPN. Retrieved 2013-04-29. ↑ Associated Press (2004-04-07). "WR/skier still fighting endorsement ban". ESPN. Retrieved 2013-04-29. ↑ Pasquarelli, Len (2006-05-03). "Undrafted Hokie QB will get look from Dolphins". ESPN. Retrieved 2013-04-29. ↑ Associated Press (2005-05-15). "Dolphins sign Marcus Vick". USA Today. Retrieved 2013-04-29. ↑ Associated Press (2006-05-02). "St. Louis Rams Sign Denzel Washington's Son". Fox News. Retrieved 2013-04-29. "NFL draft history: 2006 full draft". Official NFL website. Archived from the original on October 24, 2008. Retrieved 2008-11-13. "2006 NFL draft". ESPN website. Retrieved 2006-05-10. "Pro Football Draft History: 2006". Pro Football Hall of Fame website. Retrieved 2008-11-13. "2006 NFL Draft". pro-football-reference.com. Archived from the original on December 20, 2008. Retrieved 2008-11-13. "2006 NFL Player Draft". databasefootball.com. Retrieved 2008-11-13.